Maintaining a healthy diet is a key part of being a professional cyclist, but that doesn’t mean they can’t indulge in a little comfort food every now and again; even while riding a race. Orica-GreenEdge’s Michael Matthews, who held the leader’s jersey after day one at the Tour of the Basque Country, helped himself to a slice of pizza on stage four’s final climb to Arrate on Thursday. Having worked hard to keep Simon Yates in contention on the mountainous stage – the Brit finished third – Matthews took advantage of the fact that some kind fans were handing out slices of pizza to the riders. #bestfansever #PaisVasco #thanksforthepizza cheers guys. While many riders would be cautious about taking provisions from roadside spectators, in case they are laced with clenbuterol or other such illicit substances, it’s not an uncommon sight. Matthews’ fellow Australian Adam Hansen famously swigged a pint of beer while going through Dutch Corner on Alpe d’Huez. 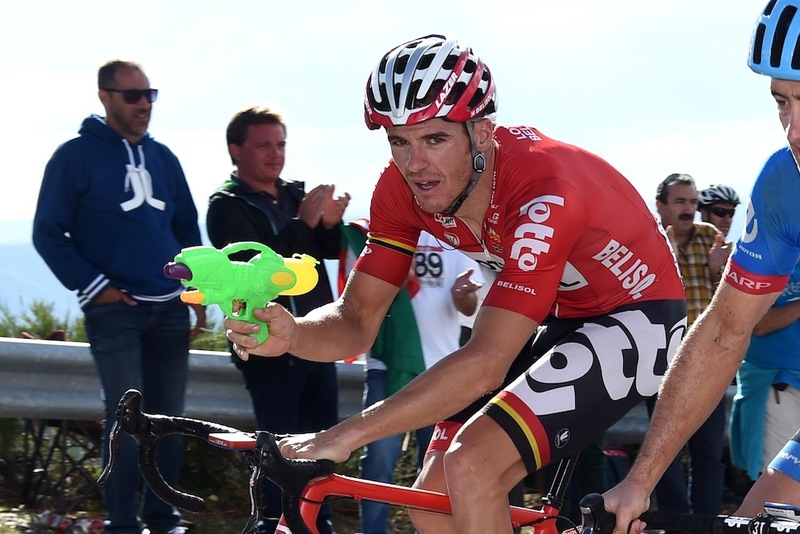 The charismatic Lotto Soudal rider also found time to swag a fan’s waterpistol on his way to winning stage 19 of last year’s Vuelta a España.